Melbourne’s own gifted vocalist, guitarist and prolific songwriter, Hamish Anderson is set to release his impressive self-titled debut EP featuring many notable musicians including members of Foo Fighters, The Wallflowers and Angus & Julia Stone. Hamish headed to Sydney to record a five-track EP in BJB Studio with producer Eric J. Dubowsky (Art vs. Science, Weezer, Bluejuice). The EP was engineered by Jean-Paul Fung (Birds of Tokyo, Last Dinosaurs, Silverchair) and mastered by Brian Lucey (The Black Keys, Dr John, The Shins). 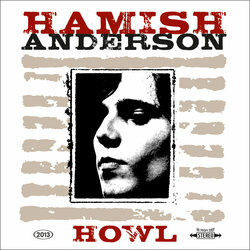 Lead single Howl is a song of human passion and provides a great first taste for listeners discovering Hamish Anderson. Howl encompasses a mix of blues, rock and folk with moments of loud, electric blues-soaked chords as well as delicate acoustic balladry, Hamish comes armed with a host of noteworthy tunes and a songwriting and vocal maturity well beyond his twenty-one years.